Despite having well-known benefits, cannabis still remains the only drug that keeps generating intense debates. One of the recent debates has been whether its use can help one lose or gain weight. While the use of marijuana has always been associated with a certain craving for food, studies surprisingly suggest the contrary. Generally, there has been a popular belief that since marijuana stimulates a person’s appetite, it simply means that it can lead to weight gain. However, this is still not proven considering that a number of recent studies have brought about lots of mixed reactions. For example, according to a study by The South Bend University, it was found that people using marijuana consumed up to 600 more calories compared to non-users but there was no any increase in their Body Max Index (BMI). In another study evaluating the correlation between the use of cannabis and obesity, it was found that cannabis users surprisingly showed little to no signs of obesity as compared to non-users. In other words, the study showed that the incidence of obesity in marijuana users was relatively lower as compared to non-users. So what really is the relationship between marijuana use and body weight? Regardless of whether marijuana is smoked or eaten, the drug affects a person’s neurobiological circuits which are responsible for controlling appetite. This, in turn, causes a temporary increase in appetite, usually referred to as the "munchies". A study conducted by Yale University School of Medicine showed that the action of the tetrahydrocannabinol (THC) found in cannabis stimulated appetite and also led to a decrease in the activity of those neurons responsible for satiety feelings. This appetite stimulation can be helpful to stimulate a rise in appetite in those people suffering from serious conditions like advanced HIV infection and cancer. However, while low-weight people, especially those suffering from cancer and HIV, are more likely to gain weight with marijuana use, the case is not same with normal or already overweight people. Can Marijuana Really Help You Lose Weight? While marijuana may not be a magic herb for weight loss, it definitely has many benefits when it comes to weight loss. According to a study by The American Journal of Medicine, regular use of marijuana is associated with very low levels of the body’s fasting insulin in addition to smaller waist circumference. In another study by the American Journal of Epidemiology, the rate of obesity was shown to be up to one-third lower among marijuana users as compared to non-users. From these studies, we can comfortably say that marijuana use may possibly help one lose weight. However, it is also important to note that it is still not an ultimate prescription for weight loss. This is because if you still maintain unhealthy eating habits and never exercise then it won’t probably help you achieve a lower BMI. It has been observed that vaping certain marijuana strains using the best desktop vaporizer can help with achieving focus, increasing energy levels, and metabolism. What this means is that taking marijuana before regular workouts can help you reach your fitness goals much faster. Another major benefit of taking marijuana before working out is relieving pain. Therefore, if you have acute pain that always gets in your way when you workout, marijuana might be the actual solution. However, all these will also depend on the marijuana strain you use. For example, the nuken strain vaped using the mighty vaporizer is ideal for relieving stress. Although the relationship between BMI and cannabis use is still not well laid out, there is enough evidence out there to support its positive influence in weight loss. According to the already available researches, appetite stimulation, as well as weight gain, may only occur in those people who experienced weight loss due to serious diseases like HIV and/or cancer. 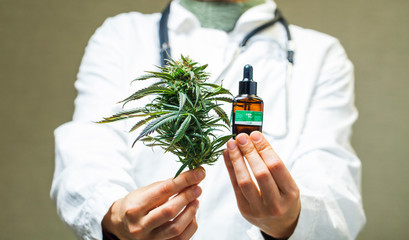 You can get marijuana products like full spectrum CBD oil, marijuana seeds, and various types of strains online or from any medical marijuana dispensary where it is legal. Although we still have quite a long way to go in terms of studying the effect of marijuana on body weight, chances are high that in future those people looking for weight loss may get a response like ’just get high’’ from their surgeons.